Lynxmotion Visual Sequencer is a Windows program for controlling anything you build using up to 32 servos using the SSC-32. 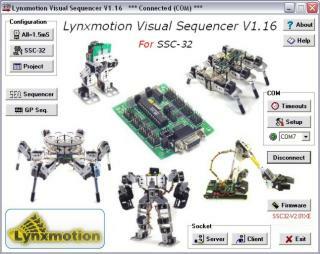 The main screen allows you to add servo control boxes, and position them on a grid. This visual representation of the robot makes it easier to position the servos for each sequence. Lots of other features. The program will even generate Basic Atom and Basic Stamp 2 code as well. SEQ ships on a single CD-R in a paper sleeve. Windows 95/98SE/2000/XP/Vista/7, Windows 8 seems compatible. New duplicate button to easily copy a project. Basic Export now supports BotBoard II. CSV Import algorithm speed improved. CSV Import progress bar added. COM port list bug corrected (Bluetooth dongle issue). Firmware update feature now supports SSC-32 V2 (Atmega 168). Bug with Timeouts' "VER test" returning a random value as "Byte read" fixed; now it returns 0. Bug with Advanced Play "Apply" feature fixed; now it takes care of the "From" step instead of always from Step 1. 16 new assignable buttons added in the "Advanced Play" form (Pose 1 to Pose 16, for a total of 45 buttons). Socket client demo buttons added to stop/pause/resume playing. Complete support for SSC-32's GP Sequencer firmware (requires a 24LC256 or 24LC512 EEPROM). EEPROM auto detect main window: Sequences viewer/editor, Control panel, Hexadecimal/ASCII editor. Advanced Play now includes 29 assignable buttons. Socket server support; control Advanced Play from an external application. Socket client to control a robot from SEQ directly with TCP/IP. BASIC export now only exports "visible AND enabled servo boxes". BASIC Export feature now supports Basic Atom OLD and NEW IDE (serout syntax). Bug with GP Sequencer exporting projects with "inverted" servos fixed. New Timeouts config for special serial COM instances (WiPort etc). New Help button on main screen. Updates to v1.01. Improved menu system and "Set 0° Neutral Position" in calibration. Fixed bug in BASIC language export. Fixed a few minor bugs. Updated manual coming soon.